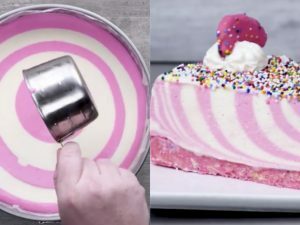 Colorful, easy and delicious zebra cheesecake. Blend animal cookies and make this wonderful cheesecake, your kids will be very happy! 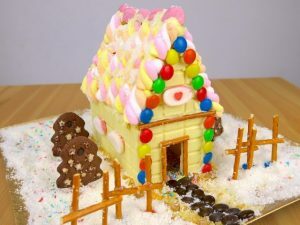 Ingredients: 2 cups pink animal crackers; 2 tbs butter, melted; 32 ounces cream cheese, softened; 4 eggs; 1 cup sugar; 1 cup sour cream; 1 tbsp vanilla extract; White chocolate ganache; Sprinkles; Whipped Cream; Additional animal crackers. 1) Blend the animal crackers in a mixer or blender until you achieve a sandy consistency. In bowl, mix the animal cracker crumbs with 2 tbsp of melted butter. When is all combined, press the crust mixture into the bottom of the mold and bake for 10-15 minutes at 300°F (150°). 2) Mix together 32 oz of cream cheese, 4 eggs, 1 cup of sour cream, 1 tbsp of vanilla, and 1 cup of sugar until everything is combined. Divide the batter into two bowls. In one bowl, mix with pink food coloring. When the base is ready, alternate the two batter to create a zebra design. 3) Bake the cheesecake for about an hour and a half. Turn off the oven and cool the cheesecake for at least one hour, then refrigerate the cheesecake for about two hours. 4) When the cheesecake is cool, sprinkle a white chocolate ganache over all the cheesecake and add sprinkles on the top. Then, once the chocolate has set pipe a few dollops of whipped cream around the edges and top the dollops with animal crackers. Animal pancakes: 4 fun ideas to get kids to eat fruit!